Best wishes for future success and congratulations go to Stephanie Bristol, who recently purchased a new horse named “Dalton” from Karen Mahaffee of Sanford, N.C.. Dalton is a 7 year old chestnut Belgian/T.B. cross with chrome, 16.2 hd. gelding. 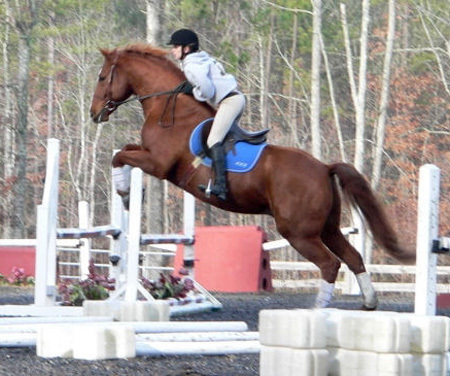 He had previously been competed through the Novice level of eventing, and has a big “puppy dog” personality to go with his love for jumping. Look for Stephanie and Dalton at the upcoming spring events and dressage shows this season. Posted in News on November 15, 2007 by danruccia.